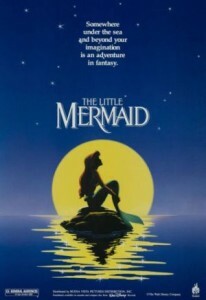 The Little Mermaid stars Ariel, a sixteen year-old mermaid who wants to have a glimpse of the world of humans. Along with her best friend Flounder, Ariel collects things left by humans in the ocean and occasionally goes to surface of the water to meet her friend seagull, Scuttle. His father, King Triton, and his adviser Sebastian constantly warns her that she should not mingle with humans. During one of their escapades, Ariel and Flounder witness a celebration in a ship participated in by Prince Eric. A storm crushes the ship and Ariel saves the unconscious prince and brings him to the shore. Ariel starts singing but immediately goes back to the ocean when Eric wakes up. Eric promises to himself to find the owner of the singing voice who has woken him up while Ariel decides that she badly wants to meet the prince again. Ariel gets berated by his father when he learns that she mingled with a human. When King Triton leaves, two eels that go by the names Flotsam and Jetsam appear and tells Ariel that a sea witch named Ursula can help her with what she wants. When Ariel meets Ursula, the witch turns her into a human in exchange for her voice. The spell will last for three days and within that time, Ariel must find someone who can give her the “kiss of true love.” If she fails to do this, she will turn into a mermaid again and become Ursula’s property. On the beach, Eric finds the now human Ariel. He brings her to his kingdom without knowing that she is his savior. Ursula on the other hand, prevents Ariel from achieving her true love’s kiss. She disguises herself as Vanessa in order to attract Prince Eric and cast a spell on him that will make forget about Ariel. On her third day of being a human, Ariel finds out that Eric is about to get married to the disguised Ursula. She learns from her Scuttle that Vanessa is really Ursula. With her friends and family’s help, Ariel prevents the wedding from happening and manages to break the nautilus that contains her voice. When she gets back her voice, Eric realizes that Ariel is the one who saved him before. He rushes to her and kisses her. Unfortunately, the suns has already started setting and Ariel turns into a mermaid again. Ursula kidnaps Ariel and King Triton saves her daughter by letting himself be taken as Ursula’s prisoner. Ursula then transforms the king into a polyp. She’s about to announce her rule all over the kingdom when Eric strikes her. Ursula gets enraged and sets on killing Eric but Ariel steps in to save him. When Flotsam and Jetsam are accidentally killed by Ursula, the witch grows into a gigantic size. On the ocean’s surface, Ursula wreaks havoc on the sailing ships and calls up a storm to destroy her enemies. Before she can kill Ariel, Eric crashes a ship on her. Ursula gets defeated and King Triton is returned to his normal self. The movie ends with King Triton changing Ariel into a human and letting her marry Eric whom she truly loves.